To have stepped out of the shadow of a genius like John Coltrane would be a challenge for a lesser talent than pianist McCoy Tyner. He is without doubt one of the most brilliant and consistent pianists of the 20th century whose six decade and counting career is still in full swing. He's left handed, which in part accounts for the attack he achieves on the bass keys of the piano, a real distinguishing feature of his playing. While being a jazz man to his core, his sense of melodic invention is always to the fore making him accessible to some who may falter when listening to some other jazz pianists. Born in Philadelphia, PA, Tyner was encouraged to play piano by his mother when he was a teenager. By 1953, aged fifteen, he was being influenced by Bud Powell, also from Philadelphia, another brilliant pianist who recorded for Clef, the forerunner of Verve Records. In 1960 the twenty-two year old Tyner began playing with Benny Golson and Art Farmer's Jazztet but soon after he joined John Coltrane's group. Trane, who had got to know Tyner in Philadelphia, had been featuring one of the pianist's compositions, 'The Believer', since 1958. Between 1961 and 1965 Tyner recorded a number of classic albums with Coltrane, including Live at the Village Vanguard, Ballads, Live at Birdland, Crescent, and A Love Supreme for the Impulse! label. In 1962 Tyner recorded his first solo record for Impulse!, appropriately entitled, Inception. It received good critical reviews and set him on course for a solo career that has lasted six decades and more; although to begin with he continued to be a member of the Coltrane group. The highlights of his early career with Impulse! are Reaching Fourth and Live At Newport, both from 1963. By 1965, Coltrane's music was moving in a different direction and so Tyner struck out entirely on his own; for a while he even played in Ike and Tina Turner's band. 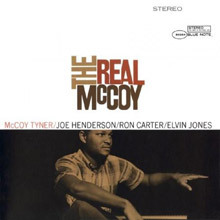 His first recording for Blue Note was The Real McCoy in 1967 and was one of string of albums during the remainder of the decade that are all well worth seeking out, including, Tender Moments (1967) and Time For Tyner (1968). In 1972 he recorded the first of his genuine masterpieces, Sahara, followed by another, Echoes Of A Friend, in the same year and Enlightenment the following year – all were recorded for the Milestone label. 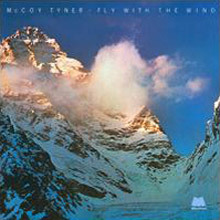 One of Tyner's most beautiful records is 1978's Fly With The Wind with its amazing title track; featured on the album are flautist Hubert Laws and drummer Billy Cobham who had been with Mahavishnu John McLaughlin's band at the start of the seventies. 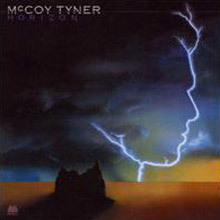 Tyner rounded out the decade with Horizon, another genuine 5 star recording. Tyner still records and tours regularly and among the titles to seek out from his more recent releases are, Uptown/Downtown (1989), Plays John Coltrane At The Village Vanguard (2001) and Counterpoints: Live In Tokyo (2004). In 1997 he recorded, What the World Needs Now: The Music of Burt Bacharach with a symphony orchestra that shows the versatility of this amazing musician. One of the most difficult aspects for producer Orrin Keepnews of recording pianist McCoy Tyner so frequently in the '70s was coming up with new ideas and settings for each record. Fly with the Wind gave Tyner a rare opportunity to write for strings. Joined by bassist Ron Carter, drummer Billy Cobham, flutist Hubert Laws, piccolo, oboe, harp, six violins, two violas and two cellos, Tyner performed four of his originals (including the title cut) plus the standard "You Stepped out of a Dream." This CD reissue has plenty of memorable moments and is a surprising but logical success; Tyner's orchestral piano blended with the strings very well. 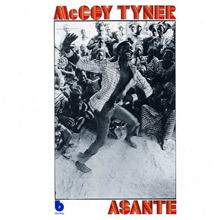 After the death of John Coltrane, his longtime pianist McCoy Tyner was in something of a musical quandary. Keeping up with his mentor through the incredible explorations of the early '60s, he seemed to have some difficulty navigating the even further out territories explored in the two or three years before Coltrane's death in 1967. His subsequent albums as a leader were solid, enjoyable efforts but seemed oddly retrograde, as though he needed time to settle back and re-digest the information handed down to him. With Sahara, Tyner found the precise perfect "middle ground" on which to stand, more structured than late Coltrane, but exploding with a ferocity and freedom of sound that made it simply one of the greatest jazz recordings of the decade. None of the other members of his quartet ever sounded so inspired, so liberated as they do here. Sonny Fortune threatens to tear the roof off the joint on more than one occasion, Calvin Hill is more than rock-solid on bass, his roots arcing deeply into the earth, and as for Alphonse Mouzon, well, no one familiar with his later vapid meanderings in fusion would begin to recognize him here, so incendiary is his playing. And Tyner develops so much pure energy, channeled with such pinpoint precision, that one worries about the physical stability of any piano under such an assault. From the extraordinarily intense "Ebony Queen" through the ruminative solo "A Prayer for My Family, the equally intense "Rebirth," and the concluding, side-long title track, there's not a misstep to be heard. 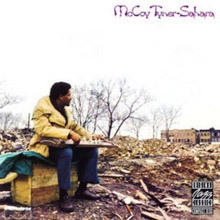 "Sahara," over the course of its 23 minutes, covers vast ground, echoing the majesty and misery of the geographical area with percussion and flute interludes to some of Tyner's very best playing on record. Even something that could have resulted in a mere exercise in exotica, his koto performance on "Valley of Life," exudes both charm and commitment to the form. 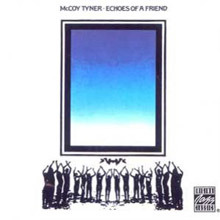 Tyner would go on to create several fine albums in the mid-'70s, but never again would he scale quite these heights. Sahara is an astonishingly good record and belongs in every jazz fan's collection. This CD has an interesting combination of players. It may be the only recording to include both pianist McCoy Tyner and his successor with the John Coltrane Quartet, Alice Coltrane (who adds atmosphere with her harp). This set also matches the young altoist Gary Bartz with Wayne Shorter (doubling on tenor and soprano), who he succeeded in Miles Davis' group, and has reunions between Shorter and bassist Ron Carter and between Tyner and drummer Elvin Jones. The all-star sextet stretches out on lengthy renditions of four of Tyner's modal originals, and there is strong solo space for the leader and the two saxophonists. Wayne Shorter in particular is often quite intense. Stimulating music. An obvious classic, this piano solo record (reissued on CD in the OJC series) features McCoy Tyner paying tribute to John Coltrane. Tyner not only plays three of Coltrane's songs ("Naima," "Promise," and "My Favorite Things") but two of his originals (a lengthy "The Discovery" and "Folks") which display how much the pianist had grown since leaving the saxophonist's group in late 1965. 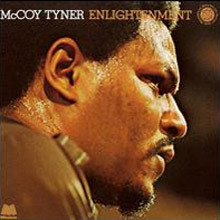 Few McCoy Tyner records are not easily recommended but this one even ranks above most. 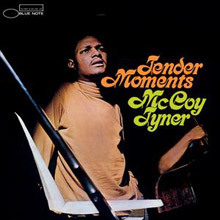 This is one of the great McCoy Tyner recordings. The powerful, percussive, and highly influential pianist sounds quite inspired throughout his appearance at the 1973 Montreux Jazz Festival. Azar Lawrence (on tenor and soprano) is also quite noteworthy and there is plenty of interplay with bassist Juney Booth and drummer Alphonse Mouzon. But Tyner is the main star, whether it be on his three-part "Enlightenment Suite," "Presence," "Nebula," or the 25-minute "Walk Spirit, Talk Spirit." 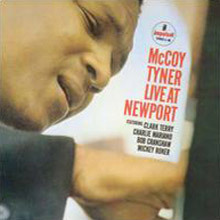 For this Blue Note project, pianist McCoy Tyner is heard solo on eight numbers and also has two duets with tenor-saxophonist George Adams and three with guitarist John Scofield; Tyner dominates throughout. A standards-oriented set (there are only four songs by the leader including "Blues On The Corner" and the near-standard "Song For My Lady") but the pianist makes every melody sound like a fresh original through his distinctive chord voicings and harmonies. This is a strong effort by one of the best. 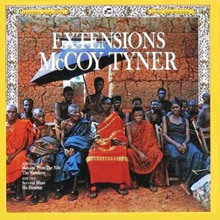 McCoy Tyner has fronted many mid-sized ensembles, but this one ranks with the very best he has led. As violinist John Blake jives and jousts with alto and soprano saxophonist Joe Ford and the incendiary tenor saxophonist George Adams, Tyner realizes a perfectly balanced, extroverted, compatible and utterly unique front line. It enables him to offer some of the most remarkable, memorable and powerful music of his career. It all starts with the magnificent opener "Horizon," which goes though a variety of dynamic rhythm changes, clarion calls, tinkling or rumbling piano set-ups prior to the band bursting loose, Afro-Cuban incursions, concise, inspired solos, and all powered by absolute perfect rhythm navigating from drummer Al Foster aside colorful percussive inserts by Guilherme Franco. It is one of the greatest single compositions of Tyner's career...sheer genius, period. "Just Feelin'" has been a piece that endures, played by Tyner in alternate trio and big-band settings as well. A singsong line courtesy of the vibrant tenor of Adams and Ford's plaintive, angular soprano radiates warmth for Blake's soaring violin to feed off of, as bright as any super nova. Blake's composition "Woman of Tomorrow, " with the violinist, both horn players switching to flute, Tyner and bass anchor Charles Fambrough is a textbook clinic exercise in beauty. "Motherland" chugs along in fierce modal revelry, powered by the rock-solid bass of Fambrough, with Adams getting to the heart of it in his typical fiery fashion and Franco urging him on playing the shekere, while "One for Honor" with just piano-bass-drums is a stone-cold hard bop wonder. The front cover has a silhouette of Tyner's face superimposed as lightning strikes fronting a raging thunderstorm, a great piece of art, as is this extraordinary recording, which cannot come more highly recommended.